Are all marine (excepting Meiacanthus anema which ventures into brackish and freshwater), found in the Indian and Pacific Oceans. 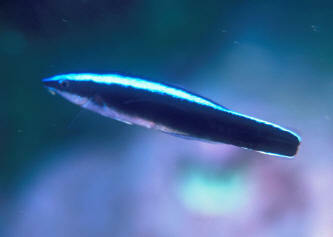 They are notable for having all their fin rays unbranched and are long in appearance, some almost eel-like. Five genera (Aspidontus, Meiacanthus, Petroscirtes, Plagiotremus, Xiphasia) with about fifty species. These Blenniids of the genera Aspidontus and Plagiotremus should be avoided at all costs (unless you want to keep one to a tank by itself or with non-fishes). These vampires have a pair of enlarged canine teeth in their lower jaw for ripping scales and bits of flesh from other fishes. Some do this by stealth, hiding in a hole in the reef and darting out for a fast-attack chomp. Others are sophisticated underwater con-artists, closely mimicking benign, even beneficent fishes. 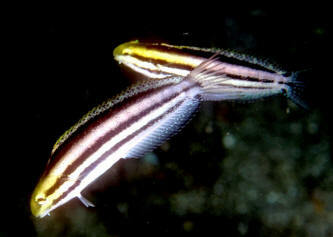 The Genus Aspidontus: Perhaps the most celebrated example of mimicry is between the Sabertooth Aspidontus taeniatus and the legitimate cleaner wrasse, Labroides dimidiatus. 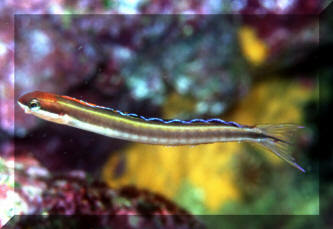 The blenny look-alike has the body shape, color, even the "cleaner" dance down to a "T"; but watch out host fishes. This nasty little biter won't be cleaning, it'll be chomping a piece out of your hide. How easy is it to be fooled over which is the blenny, wrasse? Take a look at Dakin's book (p. 180), the fish pictured is misidentified as the blenny Aspidontus; it's the wrasse, Labroides. The Baensch & Debelius, WEB/HRA/REH standard reference works cited in the bibliography accurately identify and illustrate both. The false cleaner A. taeniatus is readily differentiated by its underslung subterminal mouth. Aspidontus tractus Fowler 1903, (formerly A. taeniatus Quoy & Gaimard 1834), the False Cleaner. Mimicking Labroides dimidiatus in both color, markings and behavior, the False Cleaner sneaks up on unsuspecting victims and takes a bite out of their flesh or scales. 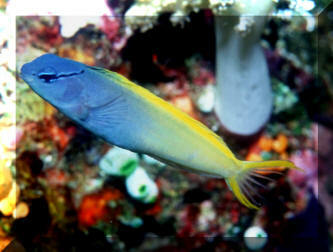 This fish is discernible from its wrasse look-alike mainly by its sub-terminal (underslung) mouth. As you might guess, rarely offered (by accident) in the trade/hobby. Note the terminal mouth in the wrasse, subterminal in the mimic blenny. An opposite benefit is conferred by the Forktail Blenny Meiacanthus oualanensis on the Canary Blenny (one of many with the same common name), otherwise better called the golden mimic blenny Plagiotremus laudandus flavus. As you know, very few fishes tangle with the blennies of the genus Meiacanthus due to their venom-gland bearing enlarged canines. The canary/golden mimic blenny, bold phony that it is, swaggers about in upper waters without fear. The genus Meiacanthus: these beautiful, delicate-appearing blennies possess strong predator deterrents; enlarged canine teeth with associated venom glands. Unlike most Blennioids Meiacanthus have a fully functional swim bladder and "strut their stuff" above the bottom with impunity. Despite their fangs, the genus makes good general aquarium and reef tank additions, being left and leaving other fishes alone. Though the genus' venomous bite does not rival a stone or lionfish sting it is painful to humans. I would avoid hand-feeding them. The Yellow, Forktail, Vampire or Canary Blenny Meiacanthus ovaluanensis should definitely be mentioned. It is a standard blenny offering. Two of my other favorites in the genus are the longitudinally striped M. grammistes and M. atrodorsalis, though there are plenty more. There are twenty two described species in this genus. Meiacanthus oualanensis (Gunther 1880), the Yellow Forktail or Canary Blenny. Western Pacific, Fiji Islands. To about four inches in length. A beautiful import from the South Seas. Feeds on plankton. Meiacanthus smithi Klausewitz 1962, the Disco Blenny. Indo-West Pacific; Sri Lanka to western Java Sea. To a little over three inches in length. This one in the Maldives. Genus Petroscirtes: 23 valid species, 31 nominal. 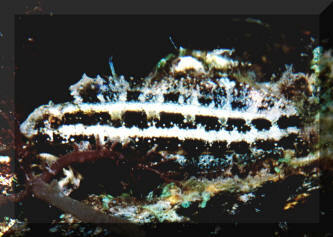 Petroscirtes breviceps (Valenciennes 1836), the Shorthead Sabretooth Blenny or Striped Poison-Fang Blenny Mimic. A mimic of Meiacanthus grammistes (see above) (most easily told apart by Petroscirtes underslung mouth). Indo-West Pacific; East Africa to the Micronesians. To 11 cm. Can and will bite if handled. N. Sulawesi pic. Petroscirtes mitratus Ruppell 1830, the Floral or High Fin Blenny. Indo-Pacific; Red Sea to Samoa. To a little under three inches in length. This two inch one photographed in the Maldives. Genus Plagiotremus: Nine species. So mean/aggressive they bite divers! 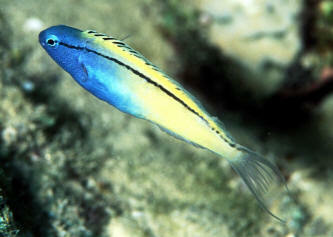 The same species may look quite different, depending on the fish it is mimicking. Plagiotremus goslinei (Strasburg 1956), the Biting Blenny. Endemic to Hawaii. To three inches in length. Off of the Big Island. 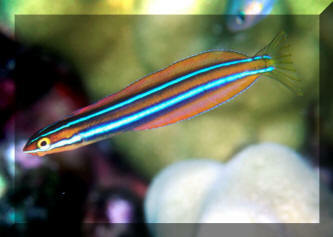 Plagiotremus laudandus (Whitley 1961), Bicolor Fangblenny. Western-Pacific; P.I., S. Japan to Lord Howe, Micronesia. All yellow subspecies P. l. flavus occurs in Tonga and Fiji. To 8 cm. Mimics Meiacanthus atrodorsalis. Eye at extreme front of head comparatively. Fiji pic. 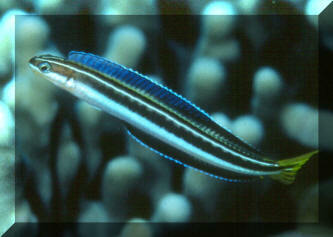 Plagiotemus tapeinosoma (Bleeker 1857), the Piano Fangblenny. Indo-Pacific; Red Sea to the Line Islands. To five and a half inches in length. Some in the upper Red Sea and Queensland who bit me.